Stand a chance to win one of four parties for you plus ten friends at the V&A Waterfront this Easter. Between 29 March and 28 April, the Waterfront will provide four colouring in sheets for young visitors to complete. Choose your favourite fishy friend who you think is the most like you, and colour that sheet in. You can collect your colouring-in pages free of charge at the V&A Waterfront Information kiosks and participating stores (Artjamming, SuperPark Playdate, Hamleys and Two Oceans Aquarium). Once you have coloured in the sheet of your favourite fish, simply drop it off with your entry form at either the giant egg in the kids play area opposite the Amphitheatre or outside the Watershed (opposite the Two Oceans Aquarium entrance). The V&A Waterfront will choose the best coloured in fish in each category. Each fishy friend is linked to a specific party venue and prize so before you choose your favourite fish, you need to consider the prize. If you are into learning about sea creatures at the Two Oceans Aquarium, like Clever Carrie, then this will be the perfect spot for you and your friends. Will you enjoy sailing the seas and hunting for treasure on the Jolly Roger Pirate Boat? Then Adventurous Alex is your chosen friend. Or if you are easy-going, creative and artsy like Laid-back Luyanda, then your party will take place at the Artjamming Studios. If you prefer fun, fit and energetic play like Bouncy Brooke, then the SuperPark Playdate party will suit you and your friends perfectly! You can colour in your fishy sheet with crayons, colour pencils or water colours. This Easter, you stand a chance to win a Lindt hamper every day at the V&A Waterfront from 1 to 20 April. All you have to do is find the two Easter Bunnies on the V&A Waterfronts property, snap a creative image with the Lindt Bunnies and share it on Instagram, Facebook and Twitter with the tag Lindt SA and hashtags, #GoldbunnyhuntSA and #ComePlayVandA. The activity is free. Enjoy some Easter fun at the V&A Waterfront’s Battery Park this Easter weekend from 12pm to 2:30pm. 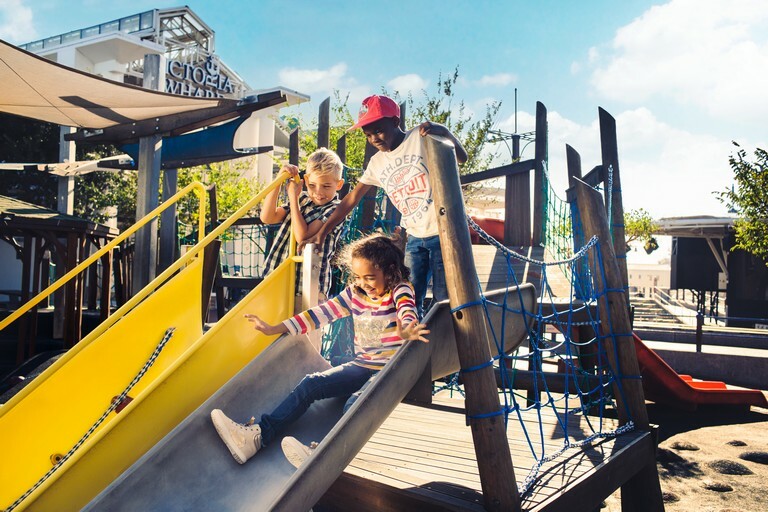 Kids aged five to nine years can get their face painted by the Easer Bunny, dance to some jams played by a DJ and win a range of prizes such as vouchers from the V&A Waterfront for kids clothing and toy stores as well as fun activities at SuperPark or City Sightseeing. All activities are free.